Remember when you buy from Freeman Schwabe you are assured that the press is built with the OEM knowdedge and engineering skills, and each type of press can be purpose designed for your application needs. 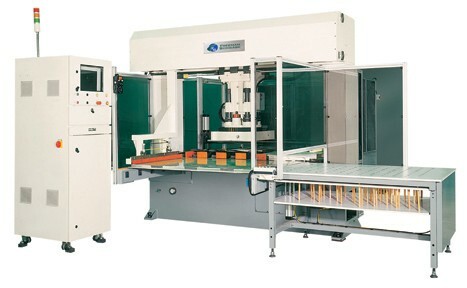 With a broad range die-cutting presses and other hydraulic machines, solutions and services Freeman SCHWABE provides Application Solutions for a wide range of Materials and Converting manufacturing processes. Freeman SCHWABE works with each individual client to understand each customer's Application Needs and provide the optimum Application Solution for the Material and the Converting manufacturing process. The RFQ Assessment Process assists in the development of the optimum Press design to meet our Clients objectives within their Budget requirements. SCHWABE Straight Ram Beam Press - Cutting Full Leather HidesThe basic building block of our large area beam presses is the SCHWABE SR Straight Ram Hydraulic series, is ideal for die cutting leather. The 350 ton hydraulic press featured in this video was designed for die cutting full leather hides. ﻿Spacer Mesh is textile fabric with holes knit into the weave which makes it breath more and creates a cool, dry and comfortable fabric. Freeman Schwabe's sales and engineering staff have developed unique solutions for abrasive cutting over the years. These solutions included protection of the machinery from abrasive particles and one example of a material handing system is a material handling solution that provide for rolls of abrasive material to be introduced into the press and stacked cut sanding disks ready for packaging coming out of the press. Abrasives scrap removal provisions can also be provided. Material Usage – no material “end loss” processing material off of the Roll. Ability to index with precision accuracy 1/32” between parts. Clamping Beam Feed System strong enough to pull 7 rolls of material off of a simple roll stand with ease. Quick die changeover with flip-up style OSHA guarding. Less than 5 minutes. Pneumatic adjustable self-centering die rails aid in the quick and easy die changeover time. Die Cutting requires specialized machines that can handle high stacks of paper and a print registration system that ensures proper alignment of die cut to printing. Freeman Schwabe Machinery has three systems that effectively cut envelopes. The first is totally automatic and has 3-axis control for the die. X and Y position the die and the third axis rotates the die for nesting. The second and third machines are manual/semi automatic presses that typically cut the corners from a stack of material. 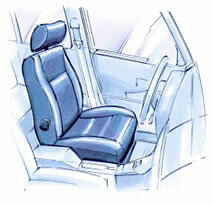 All presses can be equipped with die lubrication devices, specialized clamping, and ejection systems . 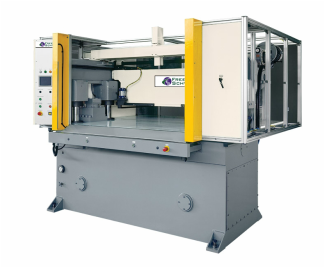 The EM Envelope Cutting Press combines the proven technology of the industry standard Traveling Head Press, and the simple operation and controls of a manual press. This press commonly uses a four-corner die that cuts the corners off a stack of paper creating an envelope. Front and Rear scrap conveyors assist the operator in keeping a clean work area. The basic operation of placing a stack of material on the press bed and pushing the start button makes this a simple press to operate. Freeman Schwabe's sales and engineering staff have decades of experience in the foam die cutting industry. If you are cutting 6-inch foam to 1/8-inch foam, we can service your needs. Our machines can be configured to produce the desired product and look your customer demands. 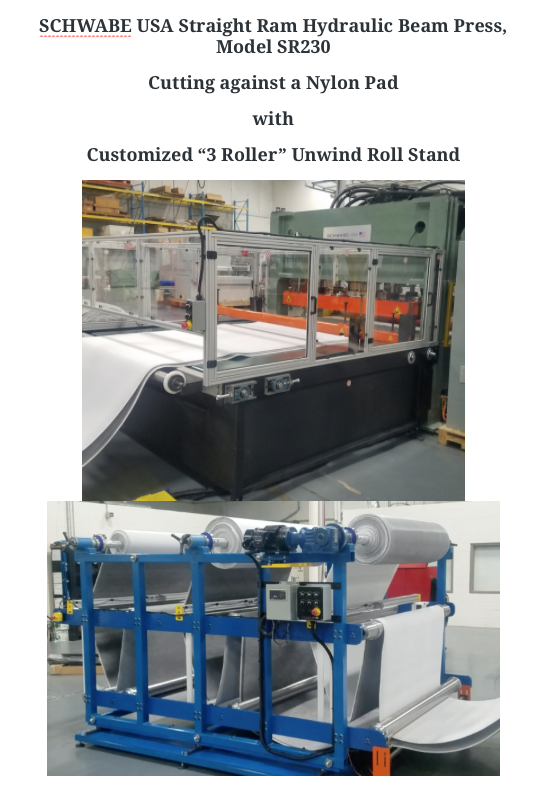 Material feed systems can handle rolls or sheet format, automatic or manual operations, cutting on belt feed systems, pad cutting or steel against steel. Motor – 15 HP Main drive motor, 1800 RPM 3/50/230V, 60 amp disconnect. Motor positioned outboard. Spare PLC Inputs & Outputs – Cabinet to be supplied with an extra 30% I/O for ancillary equipment.